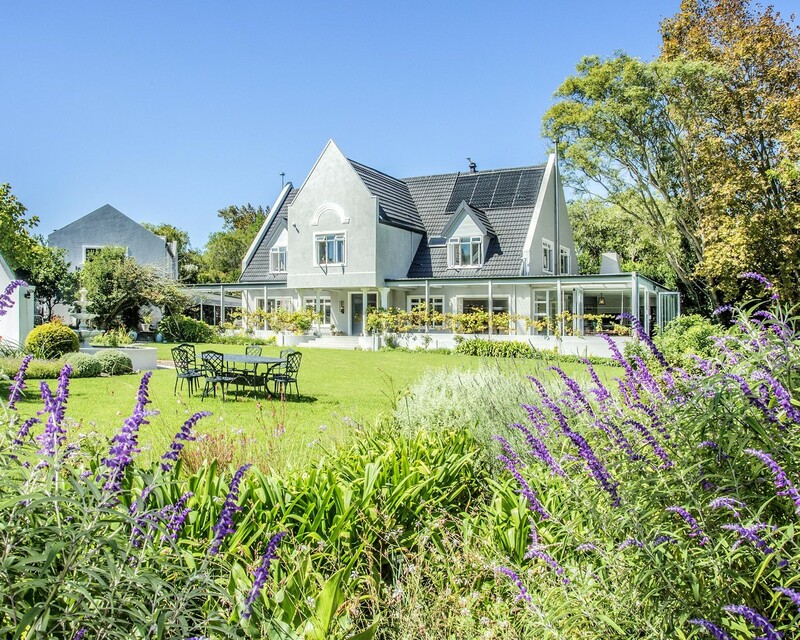 Situated on the original Farm, this character home in an idyllic setting, is framed by a backdrop of magnificent landscaped gardens, expansive and level emerald lawns and magical mauve mountain views. The vine covered walkway will invite you to the front entrance. Simply beautiful open plan receptions include a lounge, family room, dining room and glass door enclosed play / games / braai room with an informal lounge and dining area - all opening to the entertainment deck and overlooking the sensational lap pool and gardens. The stunning modern kitchen, with superb fittings, finishes and appliances, will allow you to enjoy fabulous meals with family and friends at the eat-in counter. Four luxurious en-suite bedrooms upstairs plus a fifth bedroom / guest studio / study and full bathroom downstairs. A superb flatlet with outstanding views, provides an open plan lounge, dining and kitchen, two bedrooms (one en-suite), a second full bathroom plus an attic space. Sophisticated security features will afford you peace of mind. Conveniently close to top schools including The American International, Reddam House, Herzlia and Constantia Waldorf. Near to Steenberg and Constantia Village Shopping Centres plus Constantia Virgin Active Gym and Sports Grounds. Enjoy hiking, walking, cycling or running in the magnificent surrounding green belts and mountains, wine farms with superb eateries, and Sunday drives to nearby beaches or world class golf courses. An entertainer's dream, this outstanding home situated in the sought after Huis-en-Bos pocket, offers exquisite detail and delights at every turn.